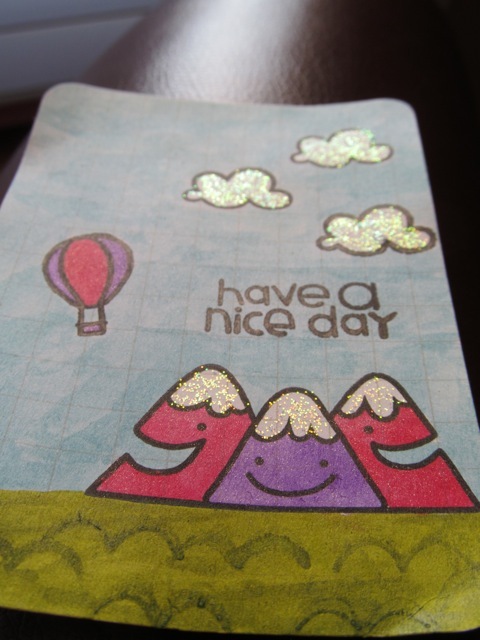 It’s been a while since I made a new tag for The Girlio’s lunch, so I thought I would use my Paper Smooches stamps and participate in the Anything Goes challenge they have going on this week, and make something! I took the second picture at a different angle so hopefully you can see the glitter and glimmer (the clouds and snow have stickles, the mountains and balloon have Wink of Stella.) I painted the sky with a mix of two blue mists and used a small brush to give the sky a little more texture, and added a bird stamp (dipped in mist) over my painted grass (a mix of two green mists) for more texture. Well, not sure if anyone is still reading this blog. Two posts this year so far. Hangs head in shame. Actually though, I have been taking care of a precious baby, two growing kiddos, working on getting The Boy an IEP and into Preschool (which of course, is at a different school on a different schedule than The Girlio), and did I mention we bought our first HOUSE???? Packing, moving, unpacking, you know the drill. Anyway, as I have finally been able to clear a path to a table in my new craft room (that’s right folks, no more desk in the corner for me-I have a ROOM!) I have a few projects to share. 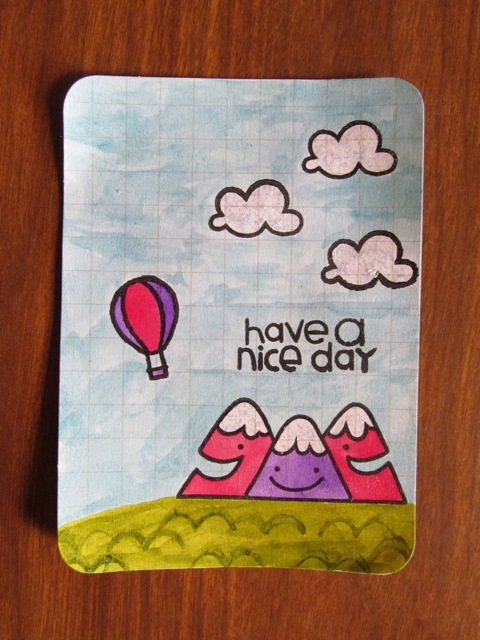 Here is the very first card I made in our new house! I found this stamp in the move, and it had never been used. Since, I am still highly addicted to painting in stamped images, I thought I would give it a go. The Color Shine added just the right amount of shine when mixed in with the pretty pink. 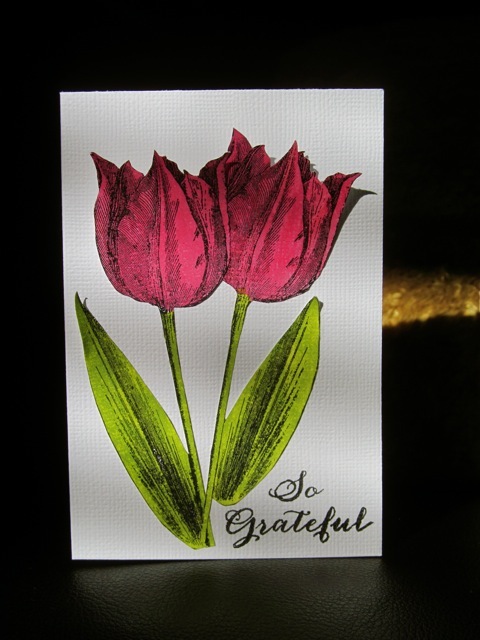 I stamped and colored two tulips and cut one leaf off of each image. I used foam dots under the petals for dimension. Where Courage Calls by Janette Oke and Laurel Oke Logan is the story of Beth Thatcher, a wealthy young woman who despite all her luxuries and privileges, wants only to follow God’s will and become a teacher. When she is assigned to teach for one year in the remote mining town of Coal Valley, she is little prepared for just how rustic the conditions are. But, she throws herself wholeheartedly into the task of teaching the children, and doing what she can to help the town. Will Beth’s efforts be thwarted by a sinister scheme? What is so dangerous out in the woods that has the children so afraid? Can her new friends help save Coal Valley? All in all, I would definitely recommend this book-especially if you are a fan of Janette Oke, or really any type of pioneer story. There is a book that comes before this one, but you don’t need to read it first. This book stands alone, and only mentions the character from the first book. There is also a companion TV series called When Calls The Heart on the Hallmark Channel. I have not seen the program, but I prefer to read books anyway. As always, my thanks to Bethany House for providing me with a complimentary copy of this book to review!